Filton, October 1939 to April 1940. Norway, April 1940 to June 1940. K6145 10/10/39 From 605 Sq. 21/10/39 Hit water low flying over Severn, near Lydney, Glos. and blew up. K7917 10/10/39 From 605 Sq. 29/10/39 To 5 MU. K7952 10/10/39 From 605 Sq. 04/11/39 To 27 MU. K7961 10/10/39 From 605 Sq. 08/02/41 To 5 MU. 14/02/41 To Royal Hellenic Air Force. 03/42 To 1411 (Met) Flight. K7965 10/10/39 From 605 Sq. 04/11/39 To 27 MU. K7979 10/10/39 From 605 Sq. 30/10/39 To 5 MU. K7985 10/10/39 From 605 Sq. 30/10/39 To 5 MU. K8004 10/10/39 From 605 Sq. 04/11/39 To 276 MU. K8020 11/04/40 From Usworth Station Flight. 14/04/40 To 6 OTU. K8027 12/04/40 From Usworth Station Flight. 14/04/40 To 6 OTU. K8032 10/10/39 From 605 Sq. 04/11/39 To 27 MU. 15/05/41 At 103 MU in the Middle East. K8044 10/10/39 From 605 Sq. 30/10/39 To 5 MU. N5579 HE-D From 152 Sq. 27/04/40 Destroyed and abandoned at Lake Lesjaskog in Norway. Later recovered and preserved at Fleet Air Arm Museum, Yeovilton, UK. N5588 From 152 Sq. 29/03/40 12:17 Lost in mid-air collision with N5690 1m E of Marlwood Farm, Thornbury; P/O Darrell Edward David Milson KIFA. (not 100% certain, which pilot who flew which aircraft). N5589 From 152 Sq. 25/04/40 Bombed and destroyed on ground at Lake Lesjaskog. Recovered frame but present status unknown. N5623 From 152 Sq. 07/04/40 Lost control in low cloud during formation flight; the aircraft dived into the sea off Portishead, Somerset; Sgt Kenneth Primrose Vickery (RAF no. 566236) KIFA. N5624 From 152 Sq. 21/04/40 Engine cut on approach to HMS Glorious and the aircraft ditched in Scapa Flow, Orkneys. N5625 From 152 Sq. To Harwell Station Flight. N5628 22/04/39 To 8 MU from Manufacturer. 27/10/39 To 263 Sq., Filton. 20/04/40 263 Sq. moved to Prestwick. 21/04/40 Embarked on HMS Glorious. 24/04/40 Flown off from HMS Glorious to Lake Lesjaskog. 25/04/40 Bombed on and destroyed ground at Lake Lesjaskog. 05/40 Sank trough melting ice on Lake Lesjaskog. 1968 Wreck found by diving team from RAF Cranwell. 08/70 Engine and forward fuselage recovered by diving team from RAF Wyton. 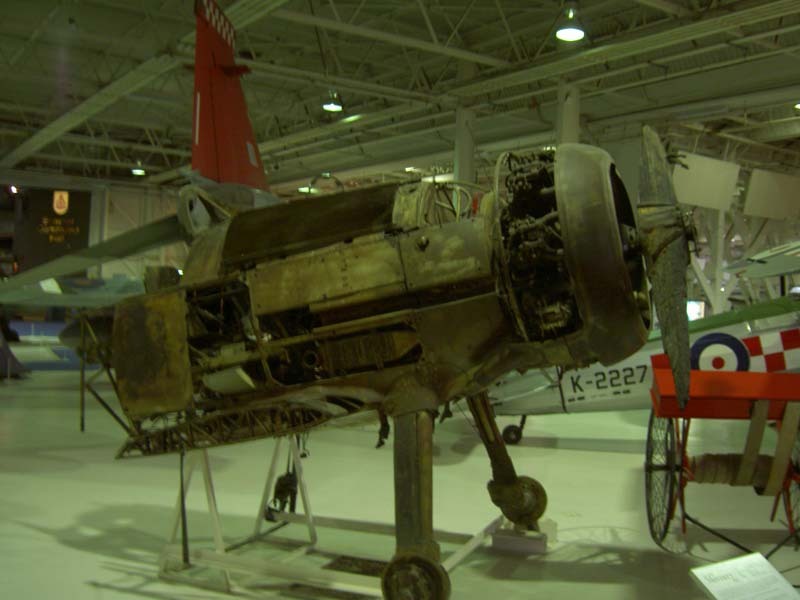 08/72 Recovered remains placed on display in RAF Museum, Hendon, UK. N5630 Later to 152 Sq. and then returned to 263 Sq. To 1403 (Met) Flight. N5632 25/04/40 Bombed and destroyed on ground at Lake Lesjaskog. N5633 HE-K Fate unknown, probably bombed and destroyed on ground at Lake Lesjaskog on 25/04/40. N5634 25/04/40 Bombed and destroyed on ground at Lake Lesjaskog. N5635 27/05/40 1 Ju 87 shot down by F/L Hull. Aircraft shot down at Bodø by Bf 110 in same combat and F/L Hull WIA. Aircraft identified by serial number found on the wreckage. N5637 To 1402 (Met) Flight. N5639 25/04/40 Bombed and destroyed on ground at Lake Lesjaskog. N5641 HE-B From 152 Sq. 25/04/40 Bombed and destroyed on ground at Lake Lesjaskog. Recovered and displayed at Royal Norwegian Air Force Museum, Bodø, Norway, in 263 Sq. colours as “HE-G”. N5644 From 152 Sq. To Shetland Fighter Flight. N5647 From 152 Sq. 26/04/40 Crashed at Litjdalen, Sunndalsøra, Norway; P/O Craig-Adams bailed out safe. Wreck recovered and serial number found on aircraft. N5649 From 152 Sq. To 247 Sq. N5680 From 152 Sq. 25/04/40 Bombed and destroyed on ground at Lake Lesjaskog. N5681 From 152 Sq. 08/06/40 Lost with HMS Glorious. N5684 From 152 Sq. To 247 Sq. N5690 29/03/40 12:17 Lost in mid-air collision with 5588 1m E of Marlwood Farm, Thornbury; P/O Patrick John Muriel Nettleton KIFA (not 100% certain, which pilot who flew which aircraft). 05/04/40 SOC. N5693 From 152 Sq. 21/05/40 Crashed into mountainside at Osterfjord, Senja Island, Norway, in bad visibility; P/O W. P. Richards KIFA. N5695 From 152 Sq. 08/06/40 Lost with HMS Glorious. N5699 08/06/40 Lost with HMS Glorious. N5705 24/05/40 1 Fw200 shot down by F/O Grant Ede. N5714 26/05/40 Believed damaged beyond repair after enemy air raid on Bardufoss. N5719 22/05/40 1 He 111 claimed by P/O Craig-Adams; the pilot KIA. Aircraft (identified by serial number on wreckage) crashed on Høgfjellet at Sjøvegan. It has now been recovered. Restoration project by Retro Track and Air and registered as G-CBHO. N5720 25/04/40 Bombed and destroyed on ground at Lake Lesjaskog. N5723 08/06/40 Lost with HMS Glorious. N5725 From 152 Sq. 08/06/40 Lost with HMS Glorious. N5894 From Turnhouse Station Flight. Lost in Norway during evacuation from Lake Lesjaskog. N5898 Lost in Norway during evacuation from Lake Lesjaskog. N5902 From 141 Sq. To 25 Sq. N5904 Lost in Norway during evacuation from Lake Lesjaskog. N5905 HE-N 02/06/40 4 sh. He 111s, 1 unconfirmed He11 and 1 sh. Ju 87 claimed by F/L Williams. N5906 08/06/40 Lost with HMS Glorious. N5907 08/06/40 Lost with HMS Glorious. It is also possible that this aircraft crashed near Torskenfjord, near Soresia, Norway, in bad visibility on 21/05/40; F/L Mills WIFA. According to unconfirmed sources a serial plate with N5907 was found on the wreckage. N5908 HE-F 26/05/40 Crashed on take-off and abandoned at Bodø landing ground; P/O Falkson safe. Possibly still buried at the end of the main runway. N5909 26/04/40 Bombed on ground at Andalsnes. N5914 From Prestwick Fighter Flight. 02/06/40 Shot down by German ace Lt H. Lent east of Rombaksfjorden; P/O J. L. Wilkie KIA. Aircraft recovered in the end of 1998 and brought to UK for restoration by the Jet Age Museum. N5915 25/04/40 Bombed and destroyed on ground at Lake Lesjaskog. Gloster Gladiator Mk.II of 263 Squadron operating from Lake Lesjaskog, Norway, in April 1940. Gloster Gladiator Mk.II N5628 of 263 Squadron at RAF Museum, Hendon, in 2007.